For this week's Tuesdays with Dorie selection, Leslie of Lethally Delicious decided on Tarte Fine on page 315 of Dorie's book, Baking: From My Home to Yours. I called a couple Trader Joe's and found that their frozen all-butter puff pastry was back in the freezer. And since Los Angeles is going through the biggest heatwave (today was 113 degrees - hottest since we kept track of these things! ), I hung out in the open freezer aisle of Trader Joe's! I only made part of the recipe...a little rectangle of butter and apples. The apples from Ha's Farm are sliced thin and layered on the puff pastry. I was supposed to role out the puff pastry a bit but it was 4:30 am and I forgot about this part. Again, heat wave = bake before the sun comes up! A quick brush of apricot jam finishes off this super easy treat. Your tarte looks excellent. I know what you mean about the heat since I was in LA myself. Hopefully cooler days are up ahead. stay cool in the heat....love the tart pictures. Your apple tart came out beautifully. Wow, I am amazed that it is still so hot in L.A.. We are enjoying warm and sunny fall temperatures here in Colorado. Just the perfect weather. That looks wonderful! What are the full name of the pastry? I have never seen them here in the South! We dont have trader joes, wish we did! Weather here is already in the middle 50's and fall is in the air so That tart would fit right in for breakfast for me. Thank you for sharing! Wow, 113? That's crazy, especially in September. We had a really hot August, but not that bad, and it's finally cooling off a bit here. Early morning baking definitely sounds like the way to go--apple tarte for breakfast! =) Your rectangular tarte is lovely. I was so excited when I found out that TJ had puff pastry again I went a little overboard and bought 6 boxes :) This looks great and perfect for the season. your tart looks so sleek! i can't believe it was 113 degrees!! sheesh! and i thought our constant 98 degree weather was horrible! hopefully it'll cool down a bit for ya! I almost squealed with delight when I saw puff pastry at my TJ's. I am in awe of you for turning on the oven in that kind of heat! It was 95 here yesterday...better a late summer than no summer I guess. I love the shape of your tart (and the rectangle means everyone gets some edge). Thanks for baking with me this week! Such a pretty tart! Looking at your pictures, it almost makes me want to turn on my oven. perhaps later this week, if the heatwave breaks. Beautiful tart! We are in the 90's in Utah, but it is better than snow. I wish we had Trader Joes here. I always make a Trader Joe stop when we visit our kids in WA. I don't think it's possible for you to make anything that looks less than decadent and appetizing. Seriously..you need to go into your own business. Love the tart! It's such a Fall thing to make! So simple and beautiful - I can't believe you baked in that heat! 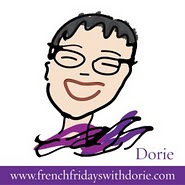 Dorie's Around My French Table Giveaway! How to Grow Tomatoes! Secrets Revealed!